I recently discovered BrüMate's Hopsulator Trio via their Instagram account and immediately sought to get my hands on it to see if it worked as nice as it looked. So, what is the Hopsulator Trio? According to the official description, the Hopsulator Trio is "the most functional drink accessory on the planet." It boasts a 3-in-1 design that combines a double-walled stainless steel and copper-layered pint glass that can hold 16oz of liquid or a 16oz "tallboy" can. To complete the trifecta, the Hopsulator Trio comes with a freezable insert that sits in the bottom of the can and acts as an arctic adapter to fit 12oz cans. 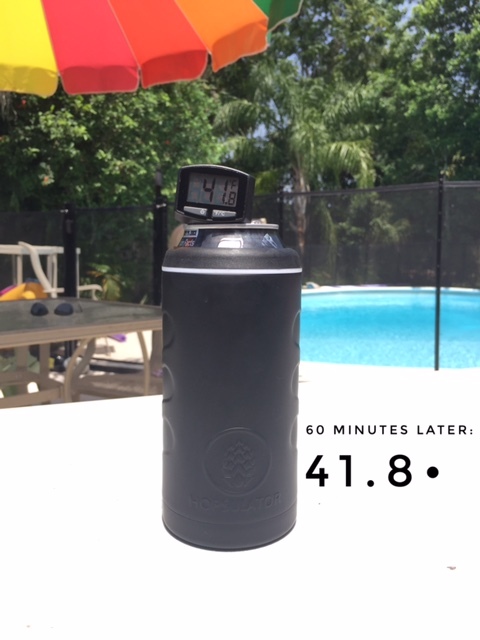 To start, I placed a cold 12oz can in the Hopsulator Trio and placed it in direct sunlight during the hottest part of the afternoon. The external temperature at the time of the test was 102°. From here, I will measure the temperature every 30 minutes for the next two hours. Why just two hours? Simple. If it takes you longer than that to finish your beer, or Arnold Palmer in this case, then you probably deserve to drink your beverage warm. Now that the test is set up and external temperature recorded, I insert the can into the Hopsulator Trio, screw on the cap, and measure the starting temperature of the liquid. Let the test begin. Scroll down to see my findings. After 30 minutes, the temperature actually went down slightly. My guess is this has to do with the frozen insert that the 12oz can rests on while inside the Hopsulator Trio. 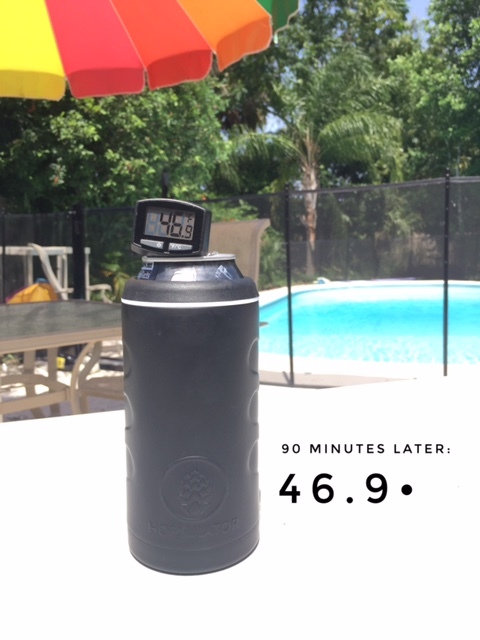 After a full hour, my beverage has warmed by nearly four degrees, but is still at a chilly 41.8°, which is more than 60 degrees cooler than the outside temperature at the moment. 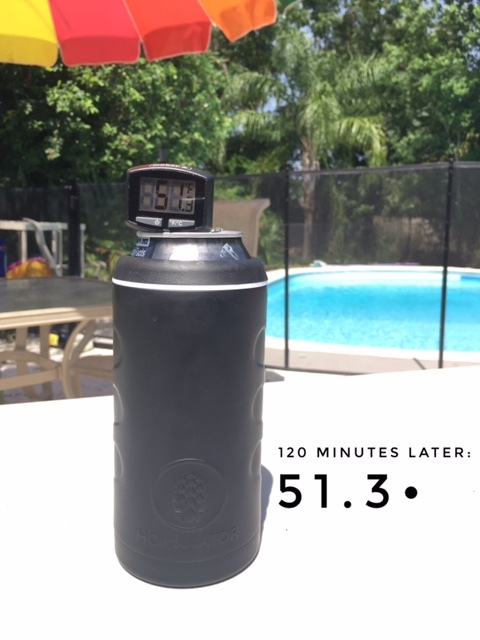 After an hour and a half in the blistering Florida sun, the Hopsulator Trio is keeping my beverage at 47 degrees, which also happens to be around the preferred serving temperature of most standard ales and lagers. 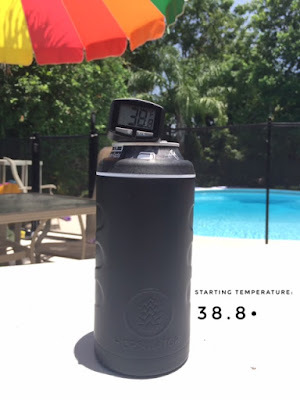 Two hours after setting my beverage in the Hopsulator Trio under direct sun, the liquid inside is still chilled at 51 degrees! The temperature rose by 12.5 degrees in that span, which averages out to be about 3 degrees every 30 minutes. Final thoughts: The Hopsulator Trio has an attractive look and comfortable feel. As you can see from the pictures in this review, the device is well insulated and keeps your beverage ice cold. There is definitely great utility in this product and I have enjoyed being able to use it as both a koozie and a pint glass. I love the arctic insert and find that to be one aspect that truly sets the Hopsulator Trio apart in what is becoming a growing market for drink accessories. Recommend? Yes! 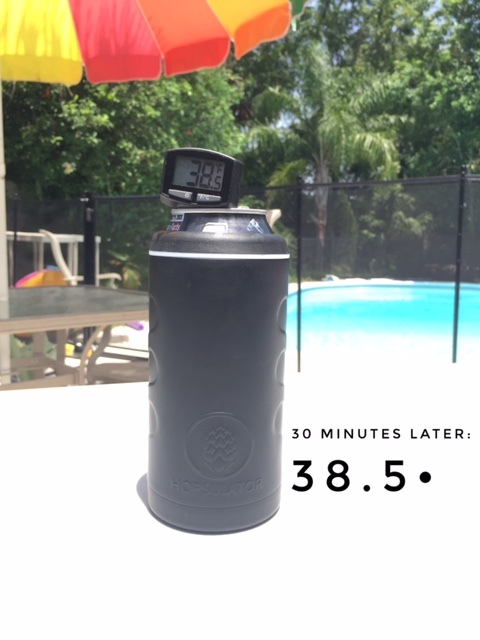 The Hopsulator Trio is worth the $25 and will become your go-to drink holder. Use it for coffee in the morning, water at your desk, or beer by the water--the versatility of the Hopsulator Trio is a key selling point. Here's a look at the Hopsulator Trio when used as a pint glass. The lid comes included. Like what you just read? Let me know by connecting with the Beer Apostle on Facebook, Instagram, or Twitter . 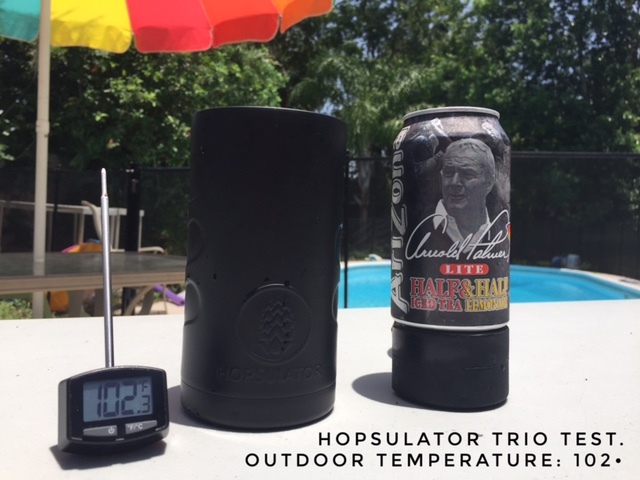 If you end up purchasing your own Hopsulator Trio, be sure to let them know you read this review! I am so happy to see Ivanhoe Park Brewing Company Celebrates Groundbreaking Ceremony with their employees.Its such a sweet gesture of them.I really appreciate it a lot.